Classic braided rugs have been a home improvement staple for years. Originally created by pioneers and early settlers to make use of scrap cloth and cording, these rugs have evolved into the quintessential go-anywhere floor covering. They’re ideal for entryways and kitchens, but are equally at home on the porch, under the kitchen table, and in the bedroom. 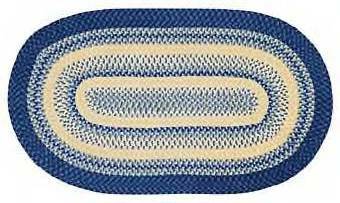 Braided rugs are composed of fibers that are tightly braided and then woven to form an almost indestructible pad. They’re thick, durable, and colorful and are sold backed or unbacked (unbacked versions need a non-slip pad if used on slick surfaces). Most braided rugs are reversible, so you can quickly flip them over if one side gets too dirty. In addition to being one of the sturdiest types of rugs around, braided rugs are easy to clean. Some of the more flexible styles can be hand-washed, hosed-down, or washed on a gentle cycle in the washing machine. Others can be steam-cleaned or dry-cleaned, ensuring long-lasting beauty. Their tight padding, texture, and easy care makes them the perfect choice for high traffic areas such as hallways, entryways, kitchens, bathrooms and porches. Braided rugs can take a beating and still look great. Traditional braided rugs used a mixed bag of fabrics, but today they are more diverse and well-planned. There are 100% natural wool varieties, as well as cotton, nylon, polypropylene, chenille, polyester, and acrylic. Many rugs are made from a combination of materials (nylon/cotton, nylon/chenille, wool/nylon), with each type of material having its own attributes. They are blended for a desired effect and to improve durability. 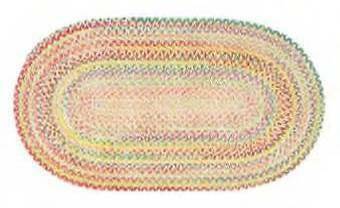 The most common shape is the oval, which was the traditional pattern used by early colonists. As the individual braided cords are worked, they are wrapped and coiled to increase tightness and connection—thereby creating a curved surface. Thanks to modernized braided and looming techniques, these rugs can also be found as rounds and rectangles. Imagine the design possibilities! Puritan and colonial retro designs mimic the braided rugs of old, but with modern materials and a longer lifespan. The traditional calico look makes an ideal impact in your cottage or country home, and there are many colonial style remakes available on the market (some of which are hand-braided and hand-worked!). These braided rug designs are ideal for your antique room, or for fans of old-fashioned charm. 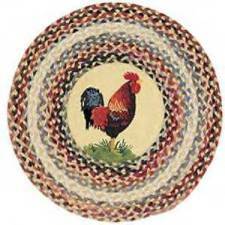 Braided rugs are most often used to decorate country-style, or to mimic early American colonial themes. However, they’re quite successful when mixed with more modern decorating themes, making them a good choice for just about any home or office. Whether you choose flat or tube braid, machine-made or hand-loomed, you’re sure to get decades of lasting joy from your braided treasures.